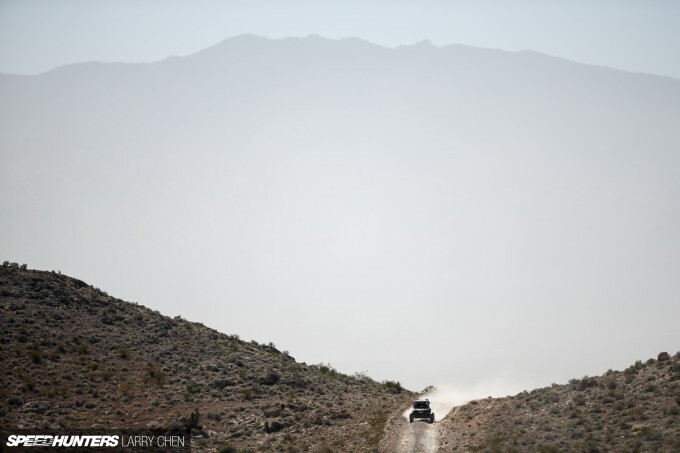 It was eerily quiet – just the sound of wind blowing past my ears and a haze of dust in the air. 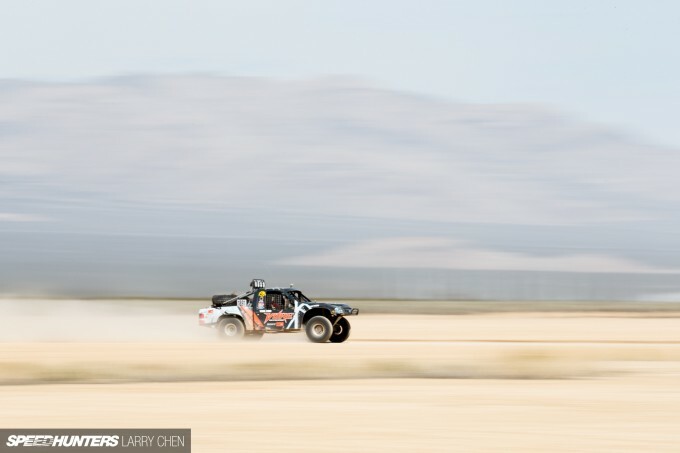 In the distance I could see a tiny spec, and as it grew bigger and bigger it was clear the first race car had reached the lakebed. 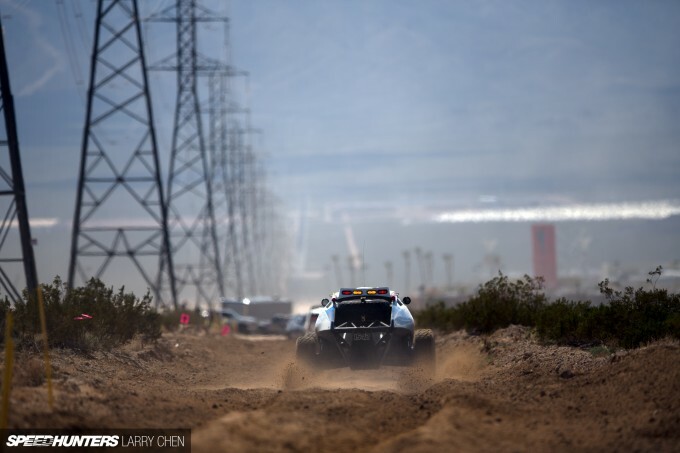 The Polaris RZR Mint 400 presented by General Tire, was underway. 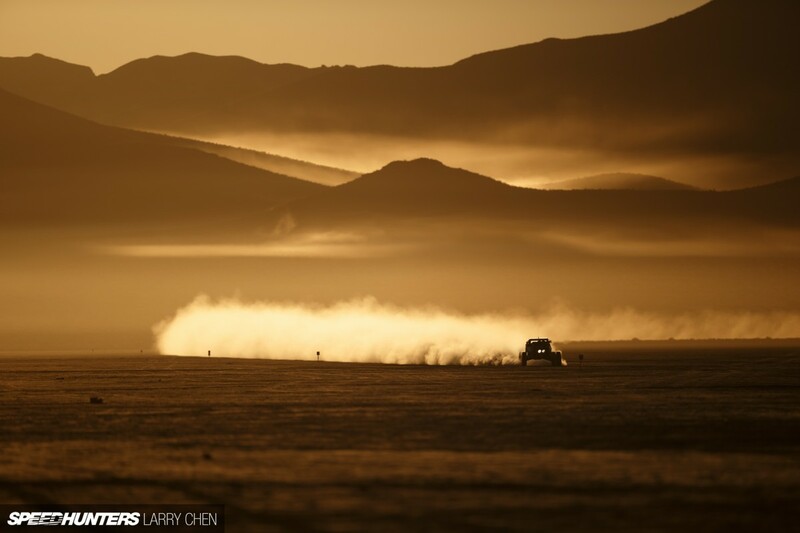 I feel at home when I’m alone on a lakebed during sunrise at the California/Nevada border. There is nothing like being out there, and if I close my eyes I can transport myself back to that moment. But why do I continue to put so much effort into this sort of thing, when you guys obviously like car features more? 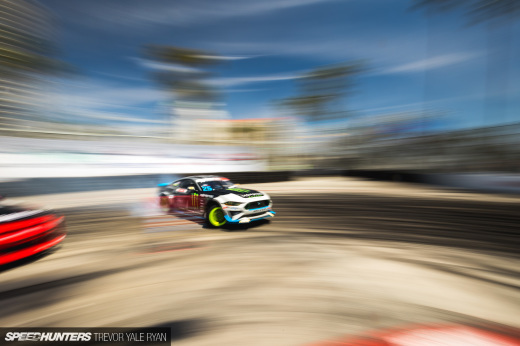 Because racing is my favorite thing to shoot – it’s that simple. I guess it’s one of those ‘if a tree falls in a forest’ things. If a race car does something amazing in a moment in time, how would people know if we were not there to capture it? 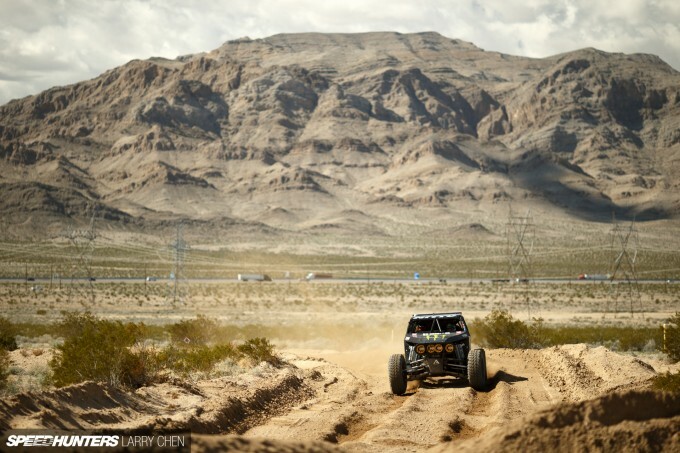 With courses generally spanning hundreds of miles, off-road racing is not the most spectator-friendly of sports. 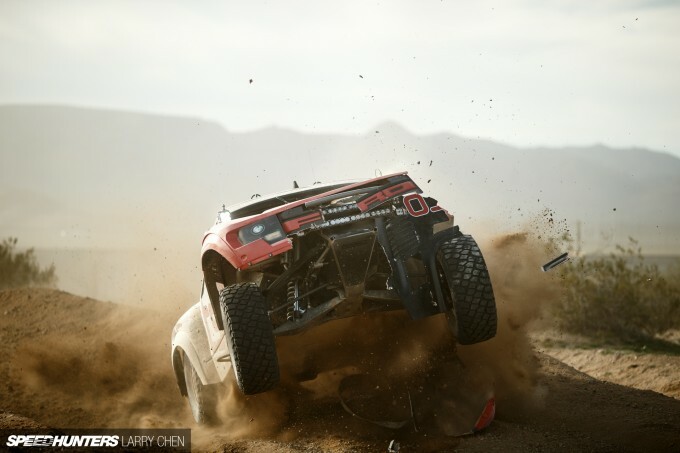 So when something awesome happens, is it just for the driver and co-driver to enjoy? It’s why I push so hard to be out there for as long as possible, because doing so only increases my odds of catching something special. This way, not only can the driver and co-driver talk about the ‘moment’ at the bar after the race, but there is evidence in the form of a photo. That awesome moment in time becomes something that the people inside the race vehicle and I can share with the rest of the world. 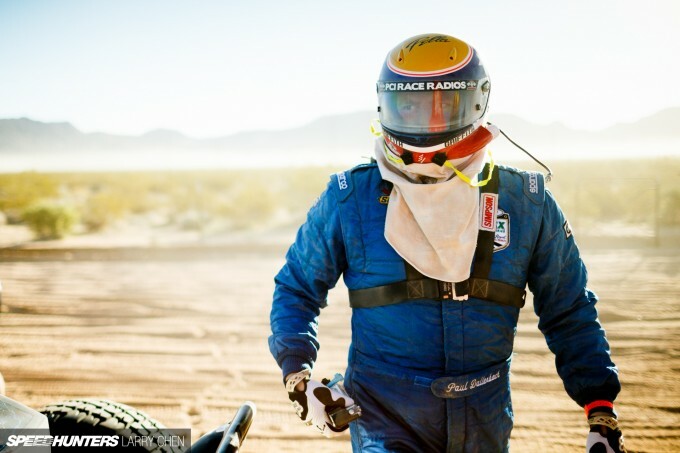 So while these photos are something you might just view in passing, they mean much more than that for the racers and I. 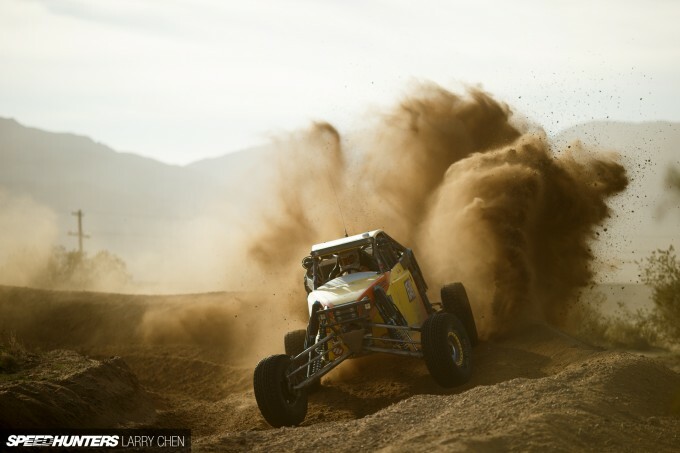 If a buggy shoots up an epic roost in the desert with no one around, did it really happen? With me there, it actually does, and you guys get to enjoy it as well. 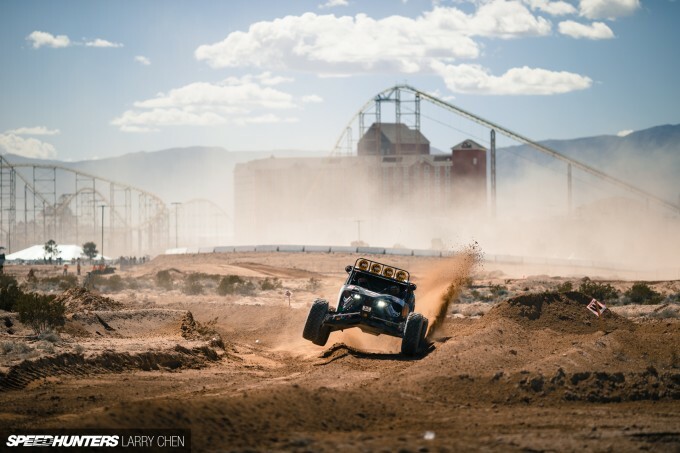 I really need to give thanks to Mad Media and the Martelli brothers, Matt and Josh, for letting me have free reign at the Mint 400. 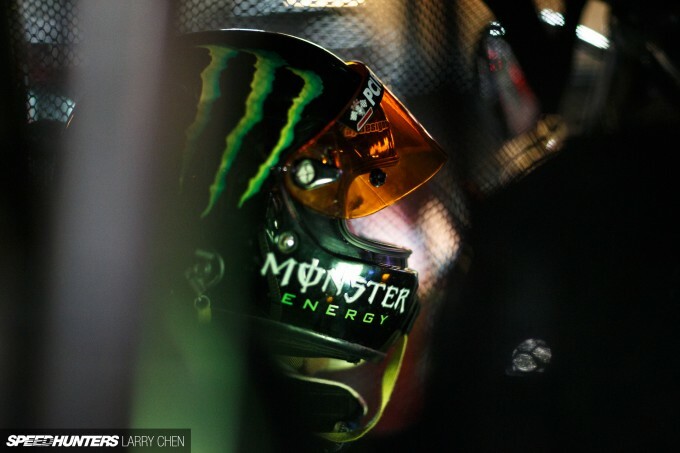 It’s one thing to be able to go to a race and be given credentials to create pictures, but it’s a whole different ball game when you are encouraged to push yourself to really create something amazing. 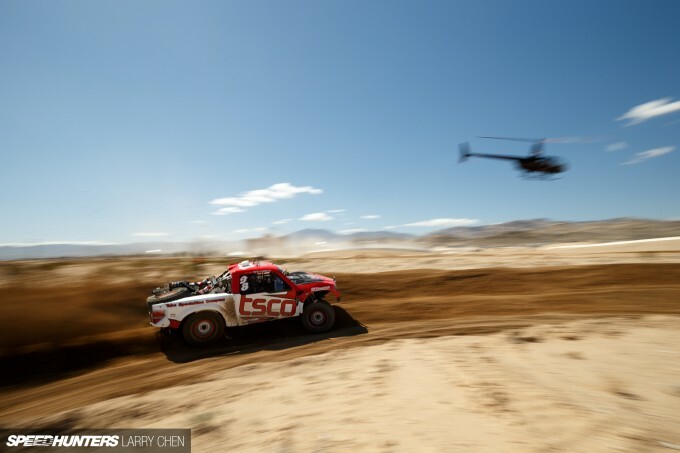 A few years ago I took the plunge and made a commitment to head out to shoot the Mint 400. With a few close friends along for the trip, I slept on Danny George’s floor and borrowed my sister’s Nissan Pathfinder just to be able to get around the course without getting stuck. 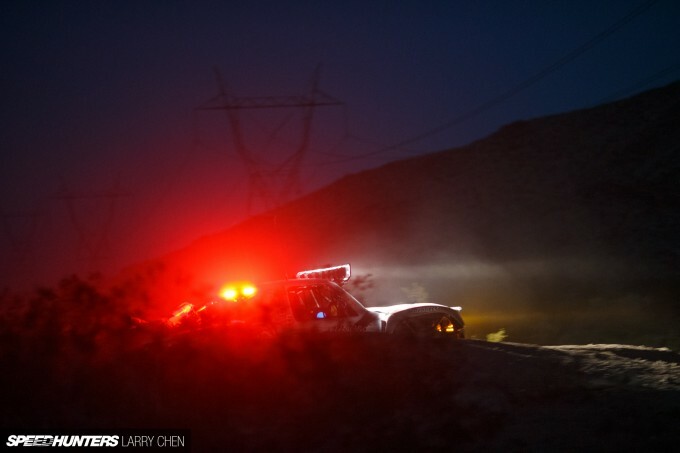 It was well worth it, and now to be invited out year after year to push myself and push off-road photography, makes covering ‘The Great American Race’ one of my favorite things. 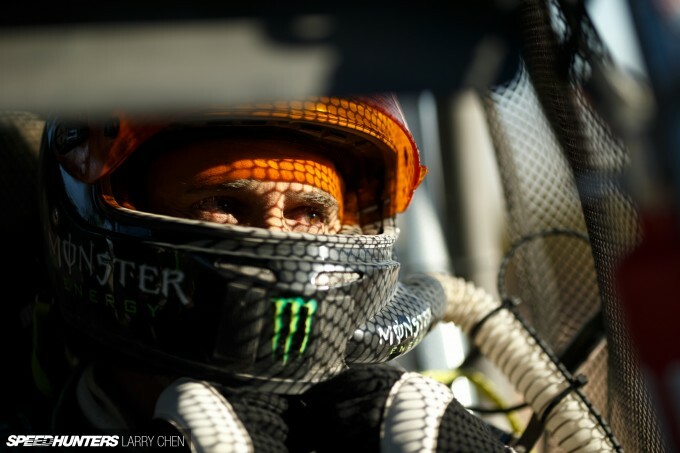 After a few years of following off-road racing, I’ve gotten to know a few of the big names in this motorsport. 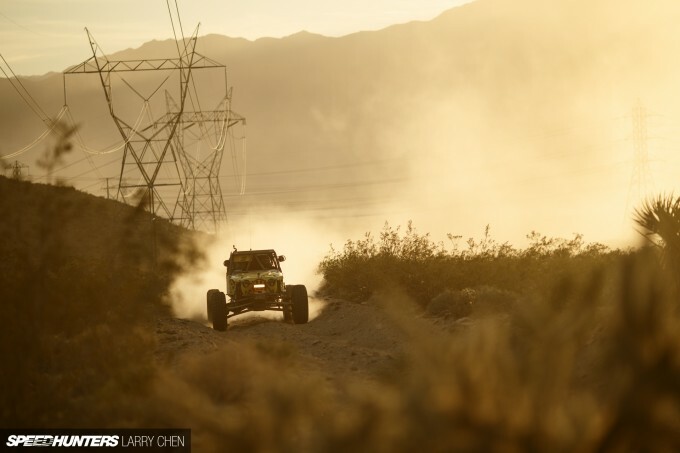 I followed Shannon Campbell and his two kids at King Of The Hammers this year, and it was really cool to see a family race together at the same event. 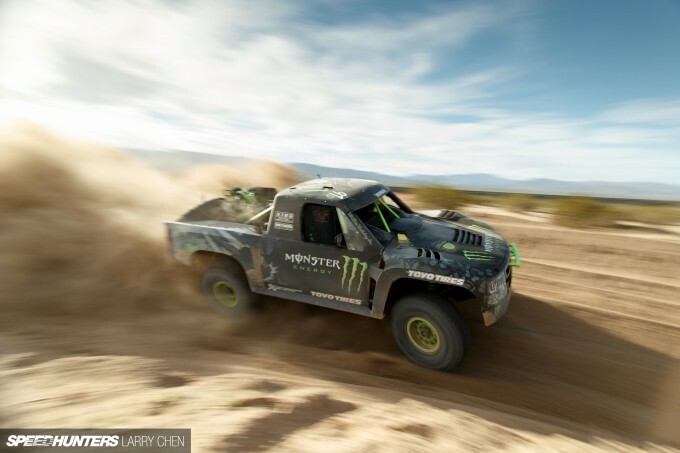 Shannon thought it would be a good idea to enter his old rock crawler in the Mint 400’s 1500 division after repurposing it for desert racing. 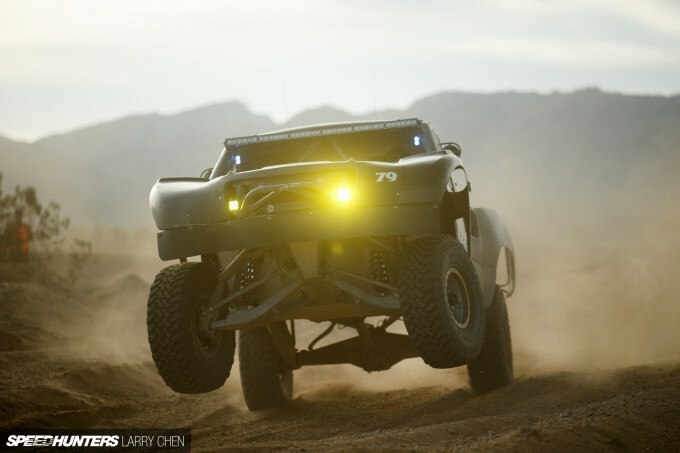 It still has a 4WD system, which may have helped as he finished 4th in class. Ever since I was on the set of Recoil 2 with BJ Baldwin, I’ve been closely following his antics. 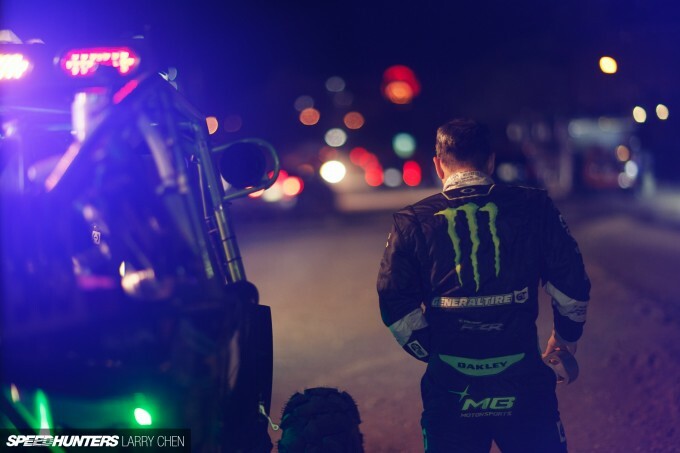 You may not like his personal style, but you just can’t knock the guy’s natural off-road racing talent, and he has those two Baja 1000 wins to back it all up. 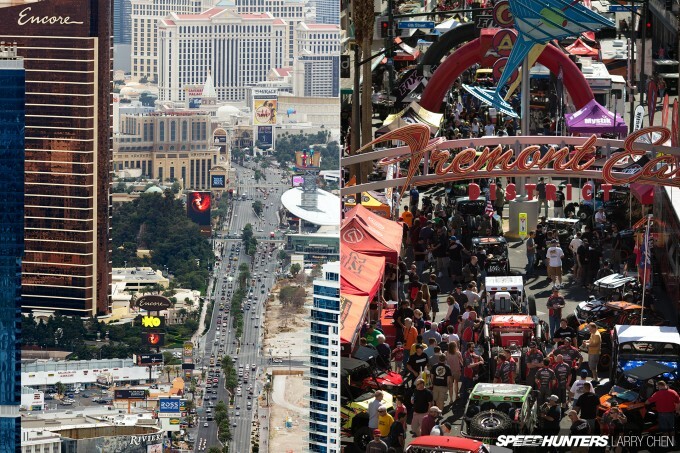 The week of festivities started with some of the race cars parading down the Las Vegas Strip and ending up in downtown on Fremont Street. 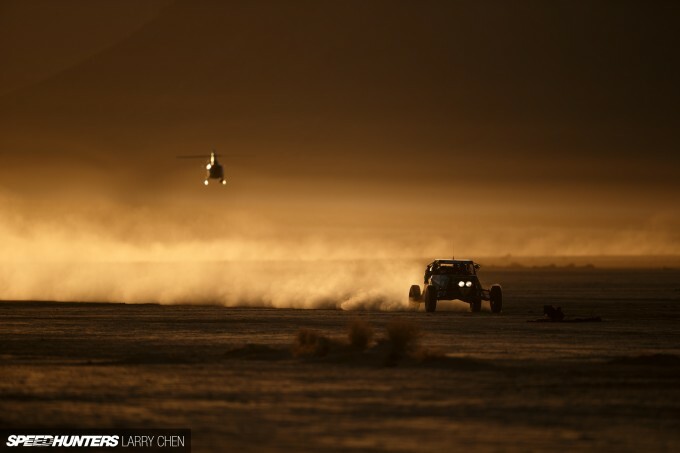 The best part of the Mint 400 is the fact that it’s very spectator friendly (in relative terms). For qualifying day, you could actually get up close and personal with the action. You could almost feel the heat from the intense competition. BJ goes into these one-off races with the intent to win. 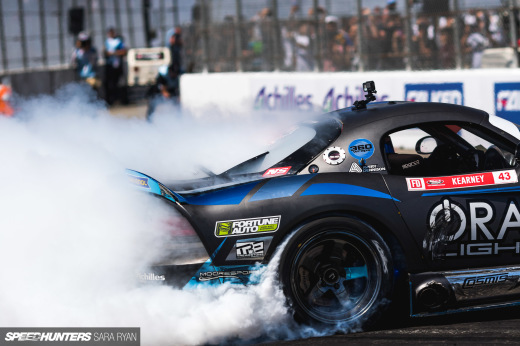 There are no important championship points on offer, so it’s either go hard or go home. With that kind of mentality, BJ pushed hard in qualifying and earned a 2nd place spot. 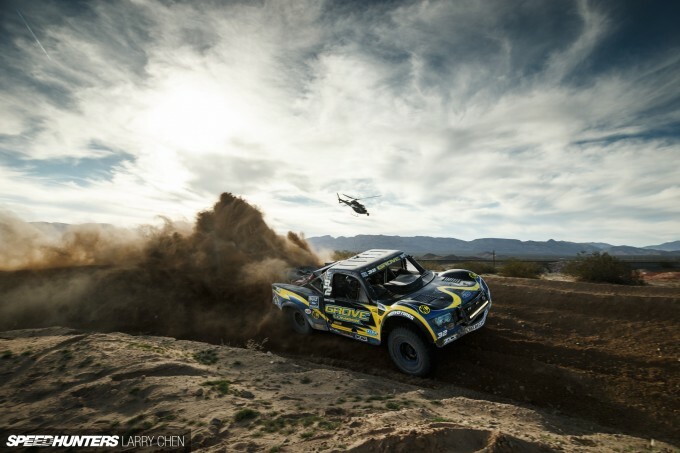 It’s always fun to watch Robbie Gordon compete, but it would be really awesome if I get a chance to follow him at Dakar next year. He really is the only hope for an American on the podium at the epic race. 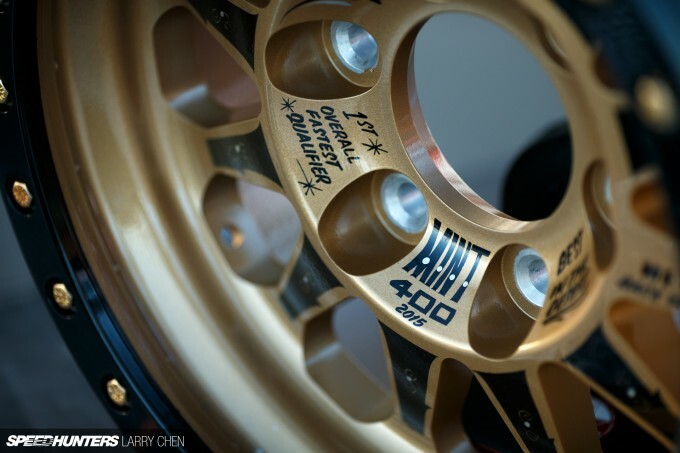 The fastest qualifier gets this awesome Method Racing Wheels trophy and some cash to boot. How cool is that? 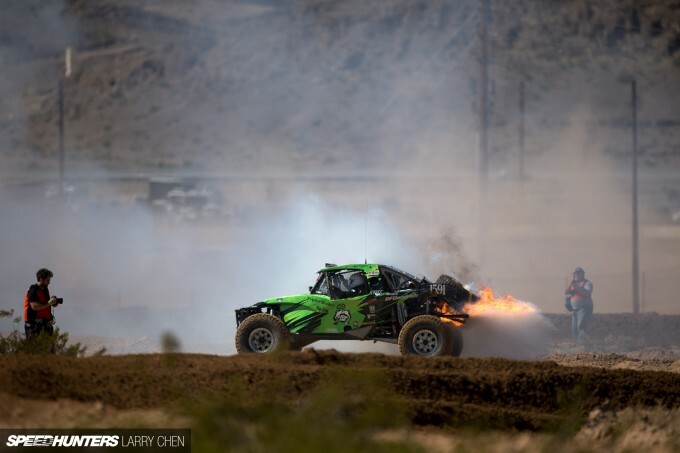 As I have learned over the past few years, shooting off-road racing is no walk in the park. You actually require a capable chase vehicle to be able to keep up with the race leaders, otherwise you’d only see them once per lap. 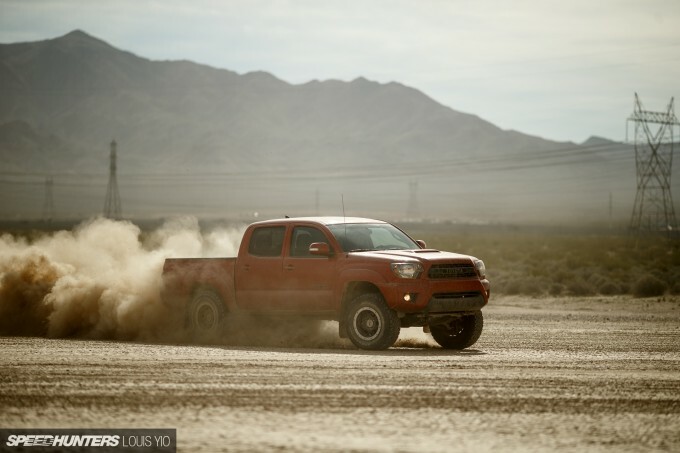 This year, Toyota stepped up to the plate and lent me a supercharged Tacoma TRD Pro. 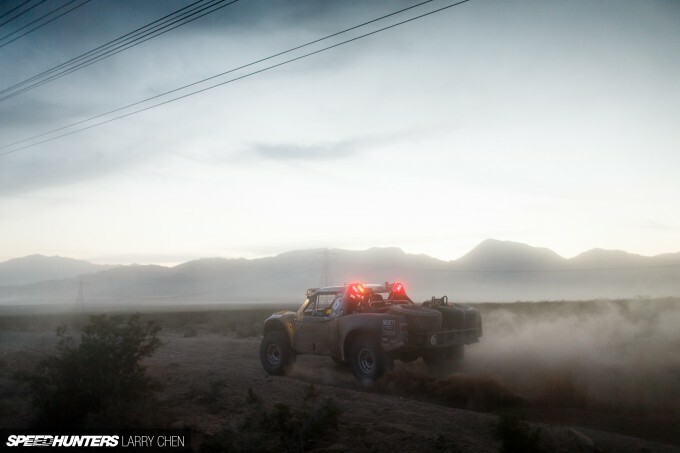 The thing ripped and it was the perfect chase vehicle for the Mint 400. Keep an eye out for a full feature soon. Having experienced both racing and photography for most of my adult life, I know that they are similar in that you won’t get rewards if you don’t take risks. So just like each and every racer on grid that morning, I had a plan. While it involved a certain degree of risk, it was going to worth it, because how mediocre would my photographs be if I just stayed in the pits and near the start/finish line all day? So at 3:30am on the dot, I woke up and headed straight for the pits. I arrived there just in time to catch a few of the teams preparing for the first race. Husbands were chit-chatting with their wives, and getting suited up at the same time. Just another day at the office, right? With so much time spent on preparation for just a single day of racing, I can only imagine what goes through the minds of the racers. 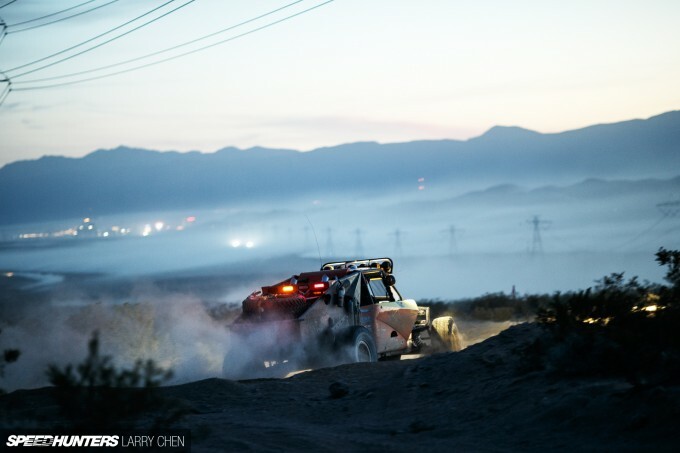 As soon as the first cars started moving out, we jumped into our TRD Pro Tacoma and headed deep into the course to catch the leaders at sunrise. 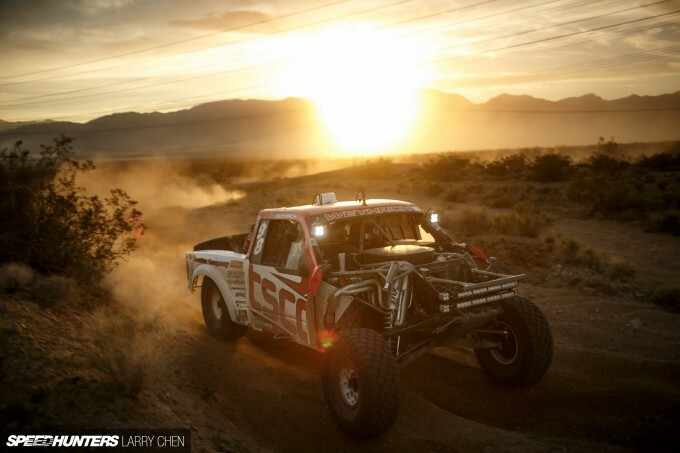 The Mint 400 is unique in that it’s one of the few races that allows a photographer like myself to enjoy both sunrise and sunset. Aside from 24-hour races, I have not had such a pleasure. One of my favorite shooting locations is on the lakebed, which is around 12 miles from the California border. It took just a few minutes for the race leader to appear, and he was booking it fast. Regardless of how early it is in the race, if you’re in the lead you don’t want to lose it – yet if you push too hard you may make more mistakes. Risk versus reward really comes into play here. I try not to stay too long in this particular location, because it’s as beautiful as it is dangerous. Within minutes it becomes a complete white-out and you can’t see a thing, which means the racers can’t see you either. We stopped at the first remote pit area where teams were undergoing driver changes, fuel ups, as well as making minor repairs. I spotted one of my favorite Pikes Peak drivers, Paul Dallenbach, who survived one of the nastiest crashes I have ever seen. What is crazy to me is that some of these guys just drive for the entire duration of the race, which means it could be eight hours before they cross the finish line. 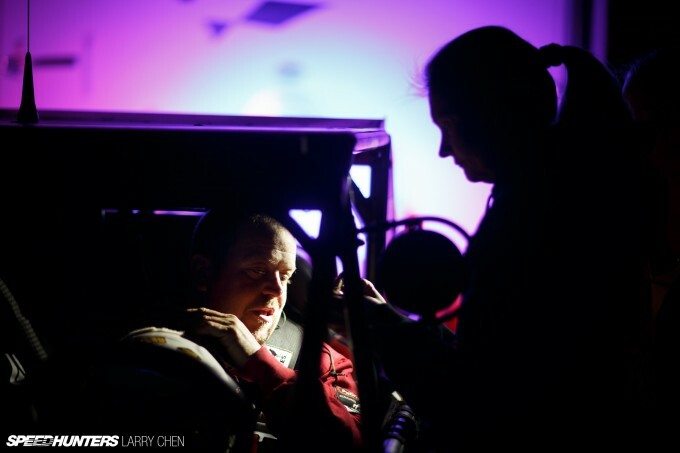 So just a few fleeting moments in the pits provides a welcome opportunity for a quick breather. 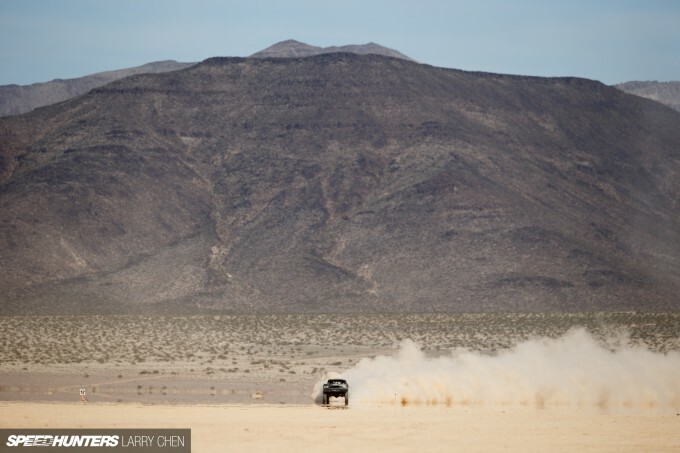 One of the things I love about shooting off-road racing is how dynamic the cars and scenery is. 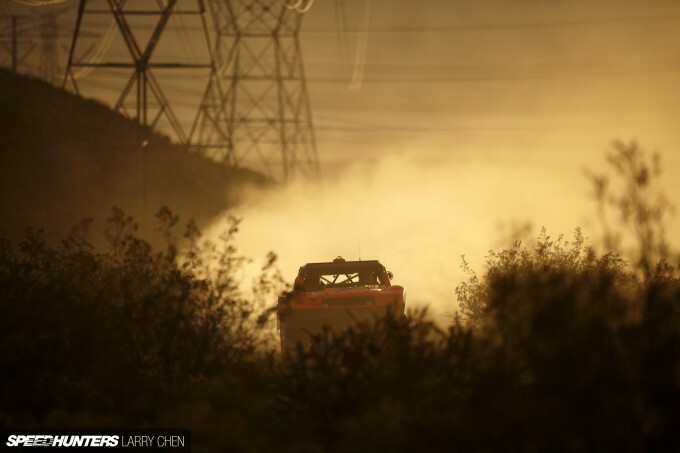 In drifting you have trails of tire smoke, but in off-road racing you have epic roosts of dust and rocks that essentially become an extension of the race car. At this point, even though the leaders of the first race were well on their way to the finish line, some drivers still had half the distance to go. But because the second race was starting, it meant that it was time for everyone who was still racing to stay off the racing line and allow the trick trucks to come through. For the start of the second race with all the fast guys, I returned to the lakebed. In the distance I saw Dale Dondel through the heat haze. Within moments Dale’s Roberts Racing rig flew by at full speed. I knew I had to get off the lakebed right away because visibility was about to disappear. 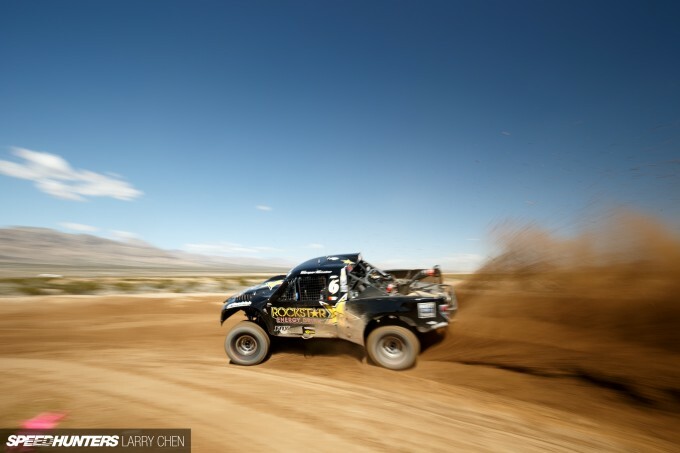 The thing about following off-road racing is there is almost no way to gauge how fast some of these guys are going in between shooting spots. So it’s very hard to figure out what is possible in terms of catching the leaders at certain points on the course. 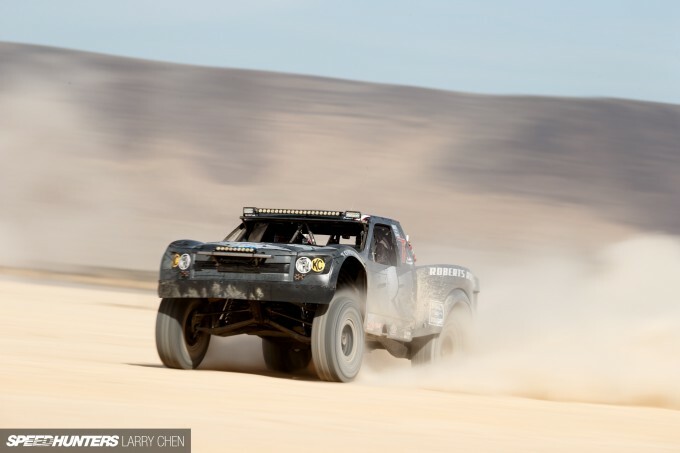 While we have an idea from following the racers in the first race, there is nothing faster in the desert than these 1400 trick trucks with their massive suspension travel. There were moments when we rushed as fast as we could to catch the race leader, just to arrive a few seconds too late. I’m talking about parking the car, grabbing the gear, and bam – the leader flies by before I can even bring the viewfinder up to my right eye. BJ Baldwin was battling for the lead and we caught him in a very silty and loose section of the course. As there was no telling if the rigs would change directions due to the nature of the silt, it was quite dangerous. 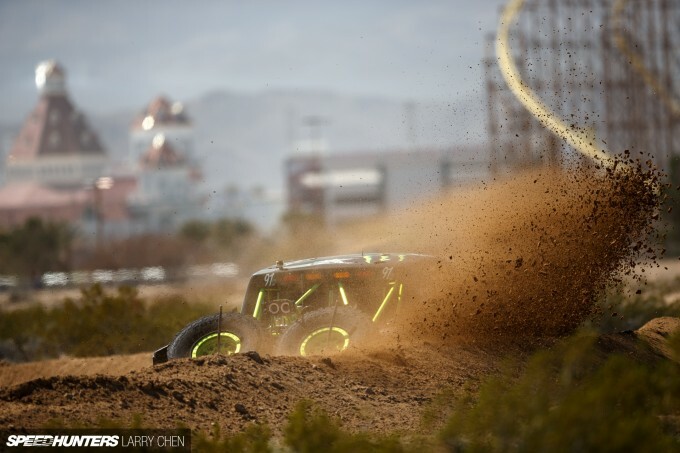 The whoops that had formed made for some awesome photography though. 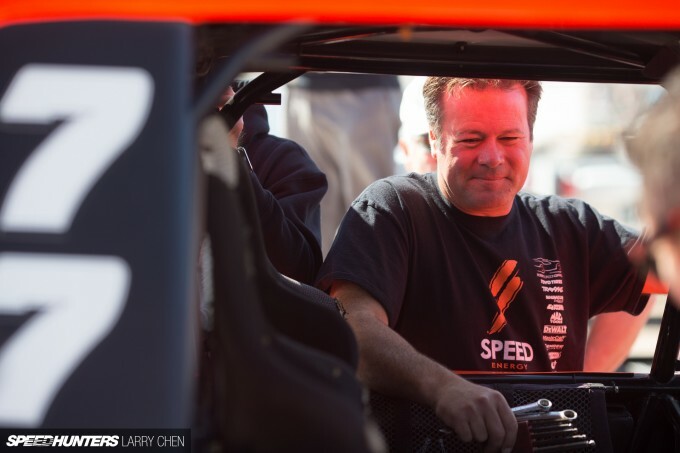 Eventually BJ suffered a transmission failure going into his final lap, which of course let Justin Lofton catch up and eventually win the race outright. The sun was setting and we wanted to shoot in an area where we had not ventured in previous years. We headed to a tight hairpin and watched most of the mid-pack racers roll through. 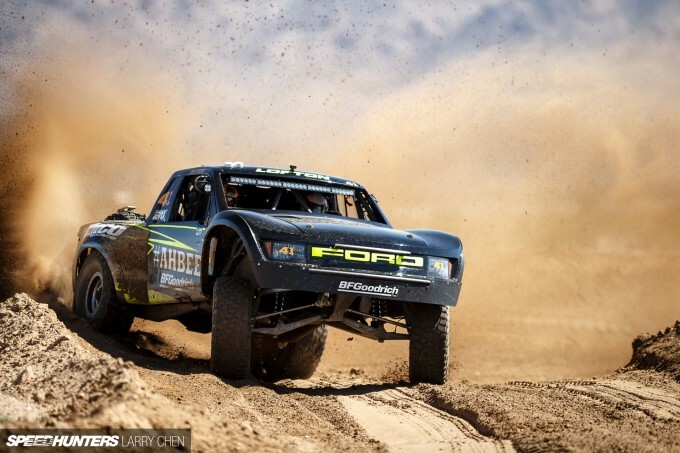 At this point in the race it amazed me that so many rigs were still looking as pristine as they did when they left the start line. Of course, most of the racers did suffer damage in one form or another though, and sometimes rigs were missing their entire front end. By the time the sun dipped below the horizon most of the field had not even started on their final lap. It would prove to be a long night for the race teams. Littered around the course was evidence of some serious collateral damage, as this was as much of a race of attrition as it was skill and endurance. 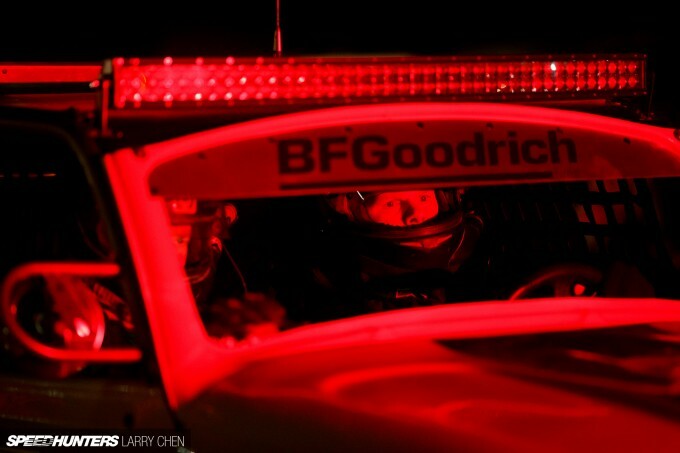 We decided to head in, as with race vehicles hitting triple digit speeds it was getting more dangerous the darker it became. 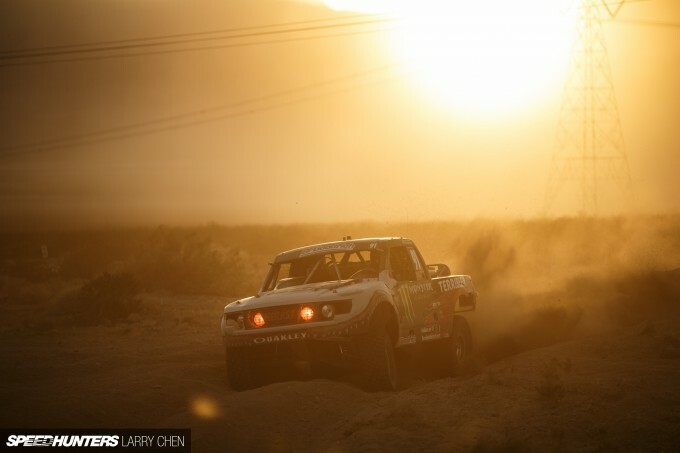 Plus, with our headlights on in the Tacoma, we didn’t want the racers to mistake our truck for that of another competitor. We kept shooting until around 9:00pm, which was quite a long day considering we woke up at 3:30am. 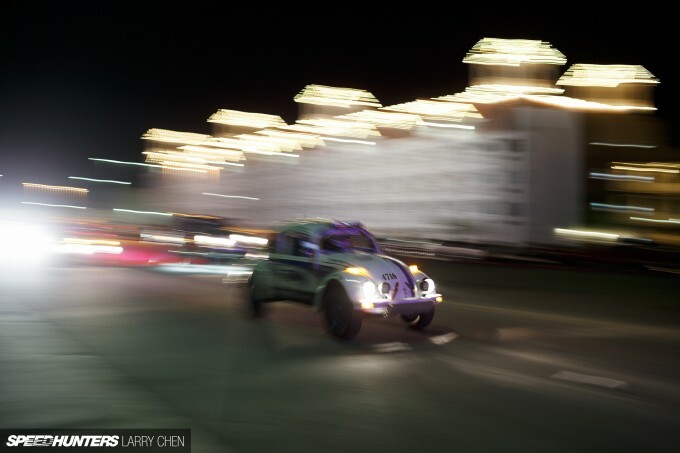 But as we checked into our hotel near the California/Nevada border, we could still hear drivers coming through the finish line, and they continued to do so till around 2:00am. Talk about some serious dedication. 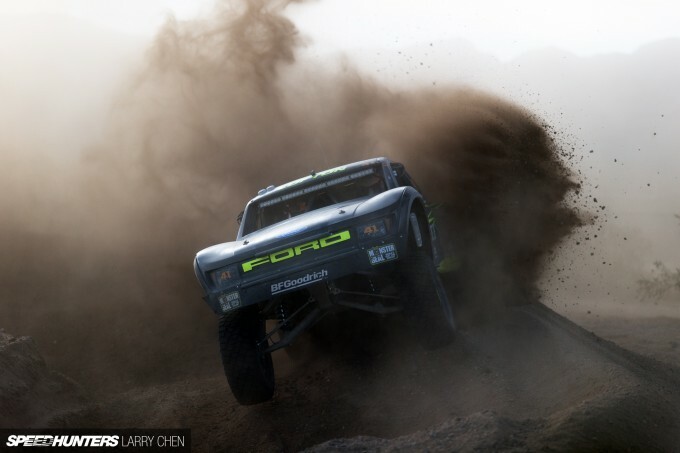 While it’s hard for many people to understand off-road racing, I’ve really taking a liking to it. 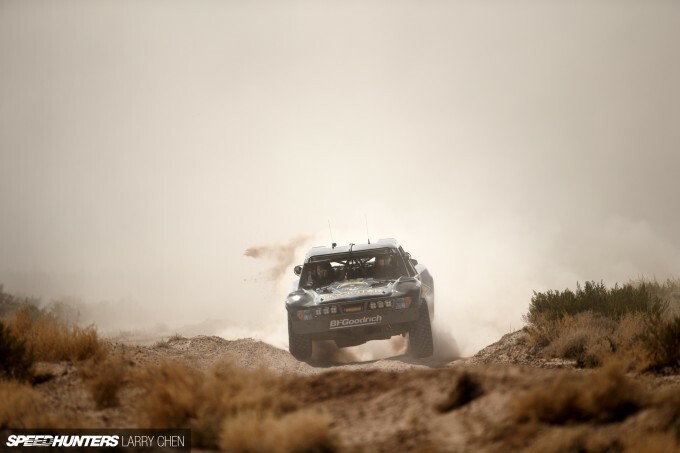 There is just something so fun about the fact that you actually have to go off-roading yourself to watch these guys battle it out. It’s definitely completely different from watching racing at a circuit where the cars essentially come to you and then reappear lap after lap. It’s something that everyone should experience at least once in their lifetime. 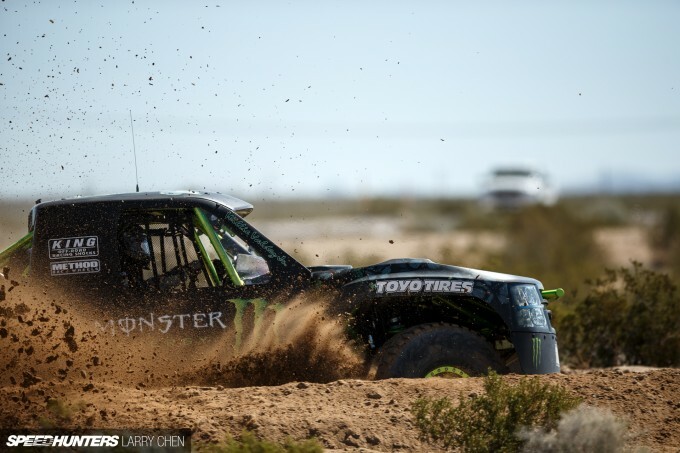 For full race results check out the Mint 400 website. Dont ever stop covering events like this Larry! 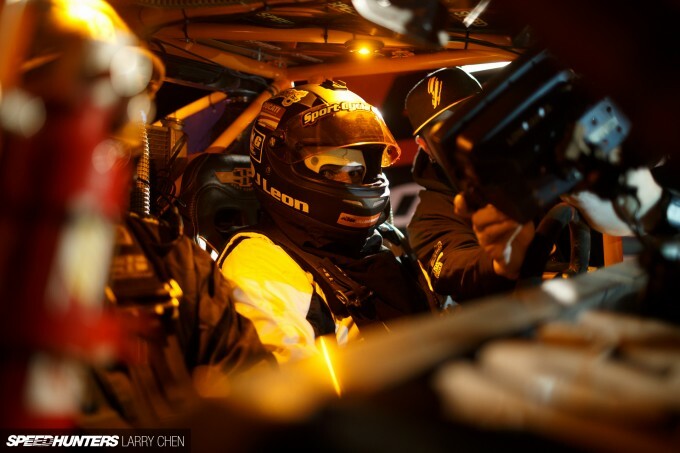 i love a spotlight on a car as much as the next but these articles are always a great read and cover some fantastic events! 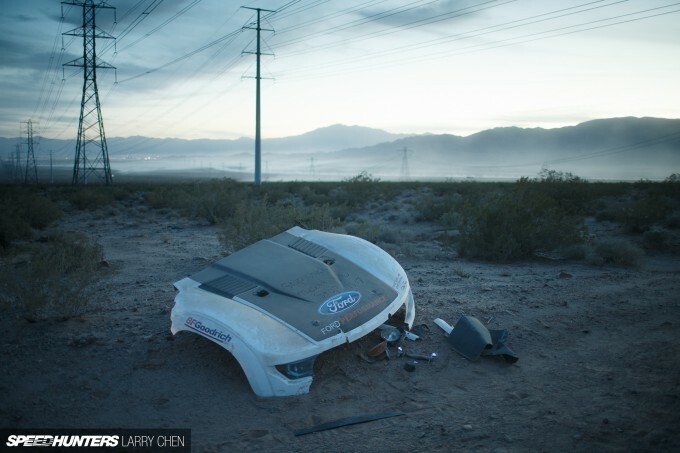 Those scrap bodywork can still be used. 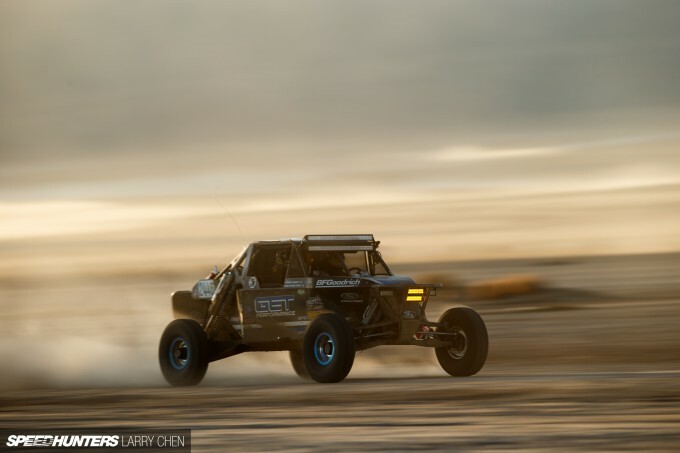 Speaking for myself only, I enjoy these offroad racing features as much as the cars. Sometimes more so when the car features become little more than lists of mods with little to no actual driving impressions or action. 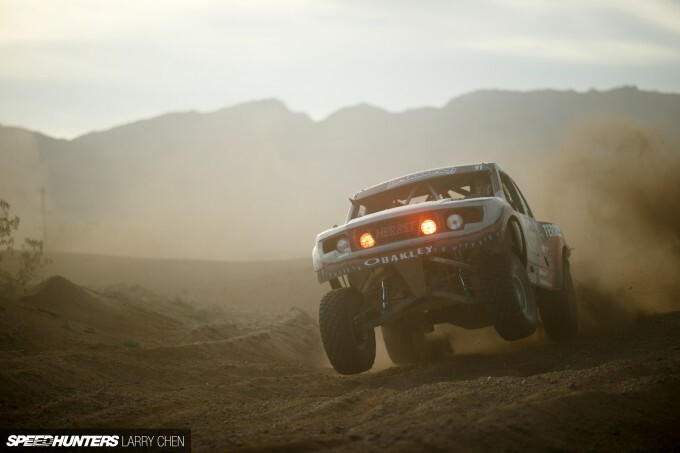 The Chenmeister's event coverage is second to none. Who doesn't like these articles??? 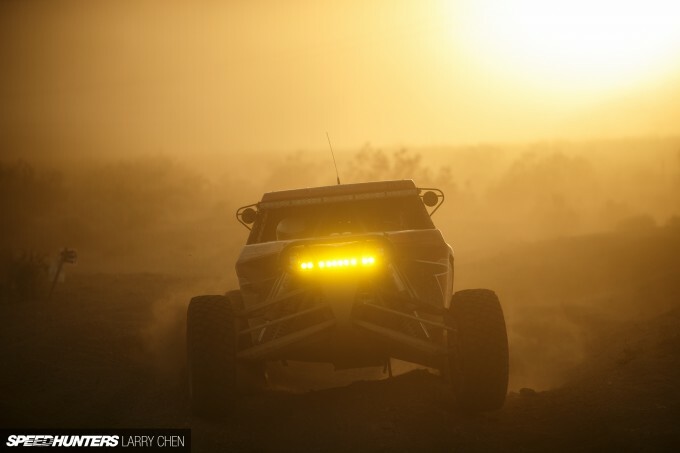 Reading your articles on King of Hammers got me interested in off road racing, and I always enjoy reading about your off road experiences. I don't have the time or money to build a proper off roader myself, so I'll need to get my fix through your articles. Looking forward to the next one Mr. Chen. I am blown away by the photography. Normally since I dont know much about photos they are a mere method of conveyance for the subject matter; its the cars that i love. These photos however are noticably awesome even to me, and I am trying to imagine the thrill of trying to capture them. Nice little reminder that SH has its roots as a car photography site. What camera and lenses are you using for the daytime action shots? 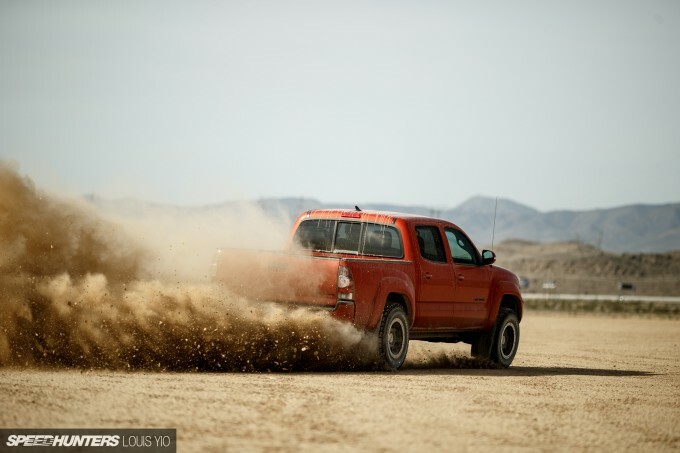 Fun read but all I could keep thinking about was the "supercharged" Tacoma TRD Pro. I hope this is a sign of things to come. A supercharger is what should of been standard for how much they charge for that truck. Almost $40K for that thing w/out a supercharger, kind of ridiculous. Thanks for the great coverage! Great to see off road finally getting coverage in a more main stream site. Keep up with the off road features. It's always a pleasure to see your work, Larry... hopefully we can shoot together soon! 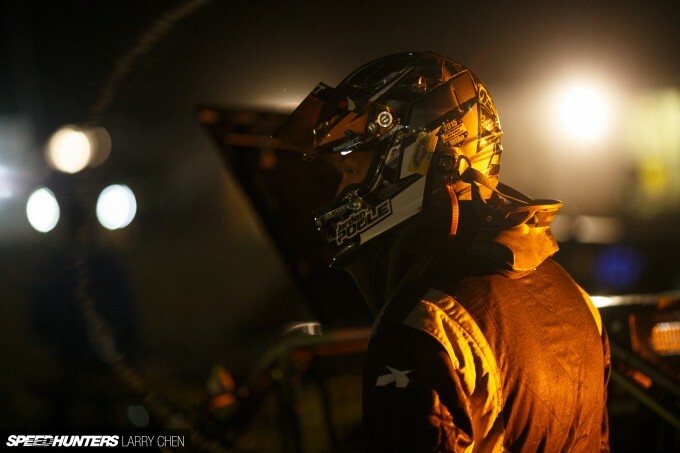 The loneliness and isolation of off road racing I think really serves to remind people that racing isnt really done for the spectators. It's done for the racers and the teams. They're the ones who want to race. If no one turned up to watch them at all, they'd still do it. But it's always cooler when other people care. 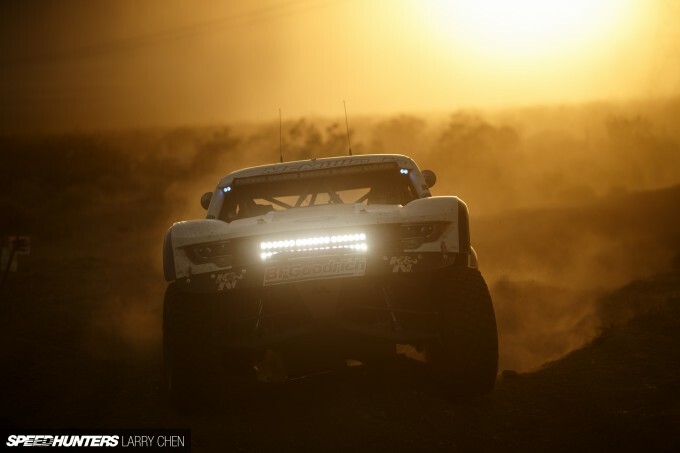 Stunning photography, the insight into the race very good too. Can I ask you what lens are you using for night time shots? 85 1.4 maybe? Please, please, please! Keep doing this, Larry! 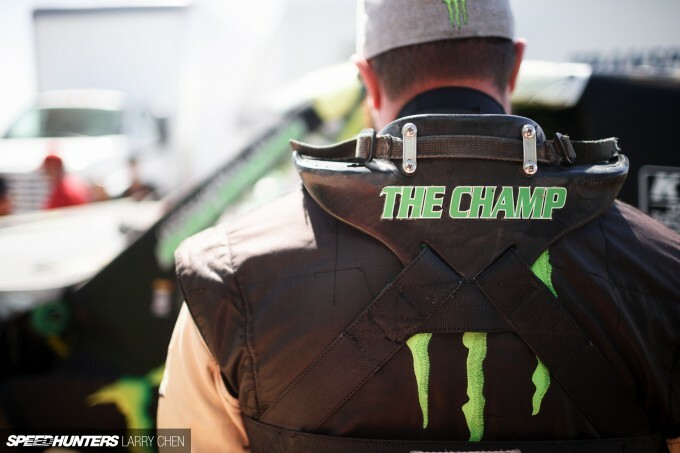 Larry with all the coverage of off road events the last 2 years, I think you should do some features on the machines. I'd love to see what goes into them and making them rip through the barren desert. 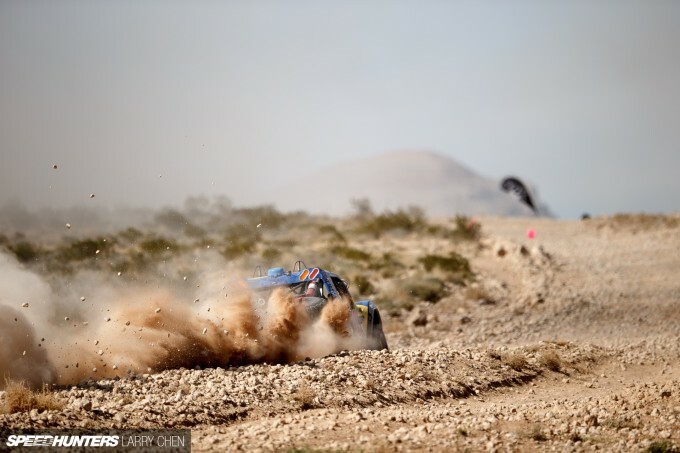 Your off-road coverage always has the best photographs! I don't usually comment on SH photography (maybe as a layman I just don't appreciate it enough) but I had to say in this case the images are absolutely stunning and coming from a long-time SH reader they are a stand-out. Keep the racing coverage coming! @gmr Thanks for the comment and for the support. @zz This is a good idea, I've been thinking about it, but I guess I just need to pull the trigger. JDM_Luca It really depends on what I am shooting at night. I mostly use my 135mm as it has a bit more range. jcali Yes, I shot a full feature. Paddy McGrath Sir, Thank you. BenjiEsau1 This means a lot. Thank you for the comment and the support. 3nigm4 Trust me, I am looking forward to shooting the next one as well. BrownBear Thanks buddy. I won't stop. @runfrcover haha, That is a good point. 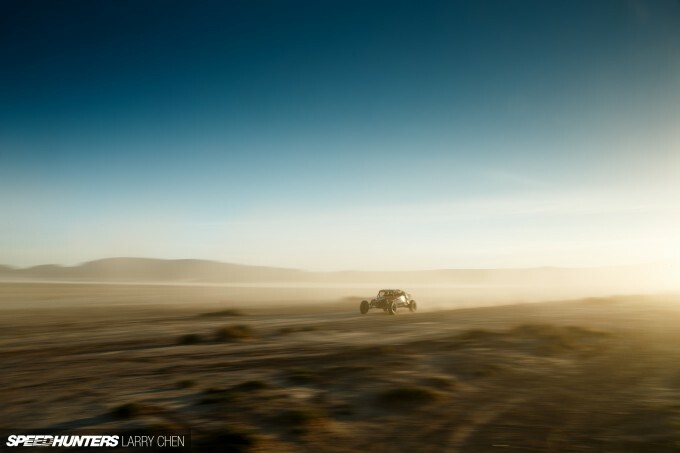 Larry Chen jcali Awesome, looking forward to it! As far as one can describe something with images and words...you nailed it! Big thanks for getting out there and letting us have a glimpse. Solid, solid photography here, Larry! 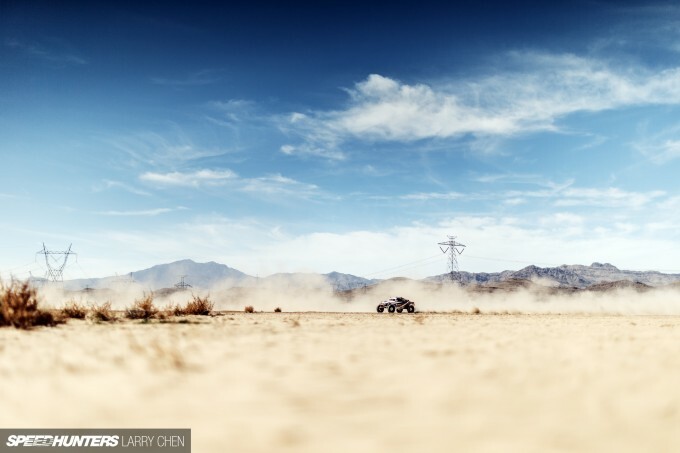 Not my scene, but amazing shots as usual Larry. Thanks! Cjackson97 Thanks for the kind words. I don't think it's really about the gear. The best camera is the one you have on you. I shoot quite a bit on my phone like everyone else. Love the off road coverage. 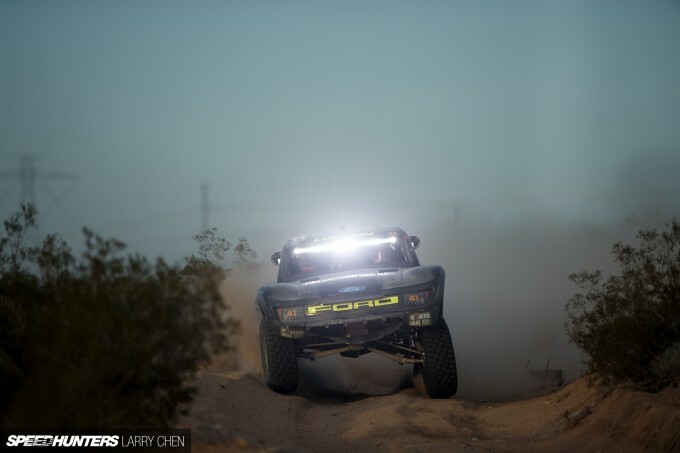 KOH coverage was killer, as usual. This is very good as well. Any plans for any coverage of rally by chance? 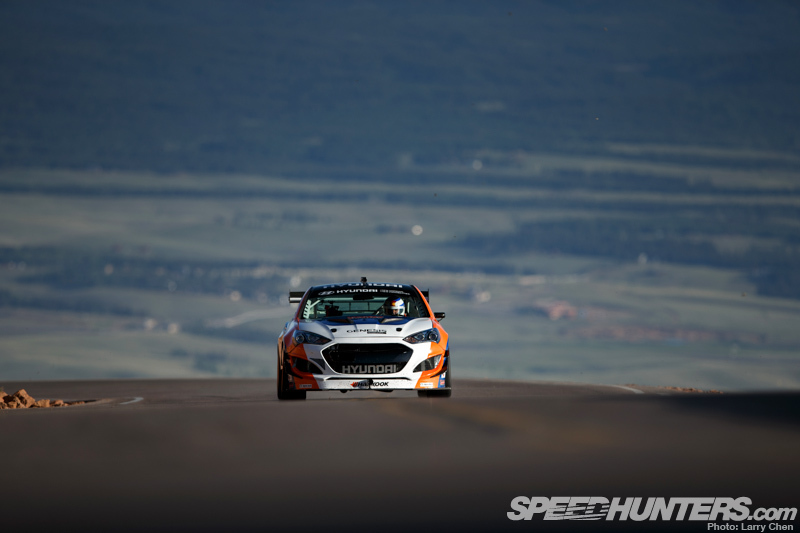 SCCA or Rally America coverage would be sweet. Awesome photos off road racing always provides plenty of great pictures but you definitely have to work for it and i can you have. 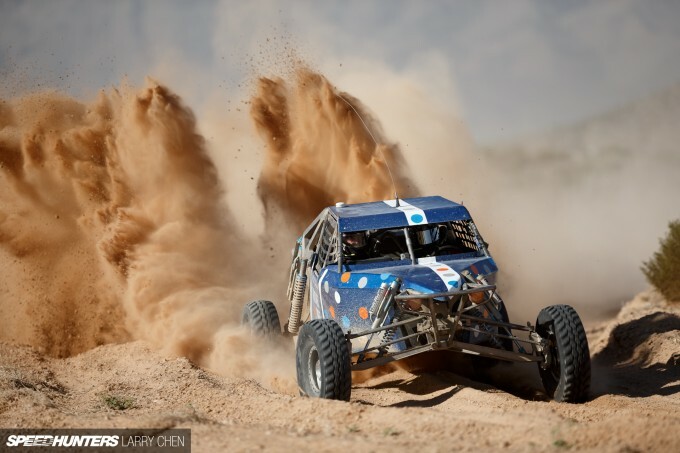 do you ever cover the vintage off road race cars?